Tom’s Construction is a locally owned and operated general contractor specializing in commercial and industrial construction in Fort St. John, British Columbia, since 1995. Tom’s Construction’s roots were in residential construction, but soon shifted to commercial and industrial projects, specializing in pile and grade beam foundation work and larger scale turnkey buildings. Tom’s Construction has a fleet of modern equipment to efficiently meet your construction needs ranging from telehandlers, rubber tired backhoes, to skidsteers and various lift equipment, including electric and 4WD scissor lifts. 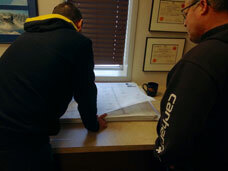 Our focus continues to be commercial general contracting as well as industrial work. Tom’s experienced and dedicated crew have continued on to successfully complete more complex jobs in the Peace Area, Fort Nelson and Alberta. Customer satisfaction is very important to us at Tom’s — it is our wish to have every client consider us for their future construction needs. At Tom’s Construction we consider safety a #1 priority and provide our staff with the best equipment to do their tasks safely. We have our own safety program that we update regularly to maintain high standards.